I'm interested in various topics such as news, fiction writing, non-fiction writing, exposing the Illuminati / Babylon system, the end times, and studying the Bible. I follow and serve Jesus Christ, the Only Begotten Son of God, who died for our sins, shedding His sinless blood, to pay for our sins. He rose from the dead on the third day and is seated with His Father in Heaven. This story is for God's glory alone. May God only be praised! Jesus in John 3:7 said: "Marvel not that I said unto thee, Ye must be born again." IF YOU WANT TO KNOW GOD'S NAME and be saved from sin, CLICK HERE. Or, keep scrolling down for the story, Steven's Amazing Adventures. (Click here to open a safe website that reads text for free. 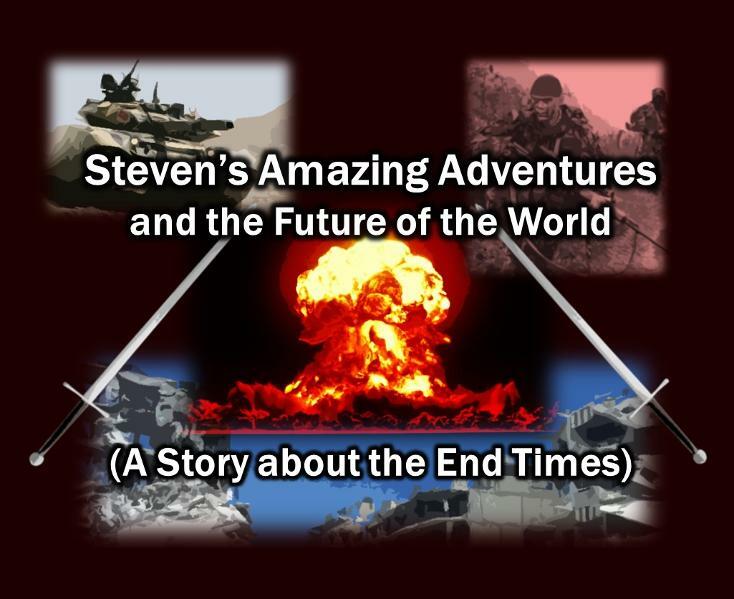 (This story chronicles the adventures of Steven O'Neill, his wife Sarah, and their friends during the End Times. Judgment has already struck the U.S., and Steve and his friends have reached the vast continent of Asia. Witness the amazing things God will reveal about the coming kingdom of the Beast (or the Antichrist), the Mark of the Beast, and the Tribulation period. This story should keep you fascinated, as a realistic account of the future unfolds in the form of a fictional story. Copy and Print for Free! Feel free to copy and paste this book or print it off at your pleasure. You can make as many copies as you want and save or print them. You can save this as a document. I offer this for free. I will make no money from this book. Just don't change the text by adding or removing words, letters, symbols, or numbers. I do this for the sake of getting the message out since we have little time left, compared to eternity. If you like, you can click here to print. The campfire flames danced and wavered over the logs, sending up wispy smoke that rose above the tree tops and dispersed. Flickering shadows fell on the grass from the twenty-plus people and their belongings. Steve stood near the crackling fire and spoke to the group which faced him, huddled by three other campfires. The quivering flames reflected in the glasses of several men and women as they listened to Steve’s teaching. Steve spoke, scanning over the faces, as he held an open Bible in one hand. A large backpack lay a few feet from Steve with an unzipped pouch, where he had stored his Bible. It had been translated to him by an invisible angel just minutes ago. “When God said, ‘Let there be light’, He was not only speaking of the visible light that you and I can see,” Steve said. “Our Abba Father God was speaking of His spiritual power to reveal Himself to His creation through His only begotten Son, Jesus Christ. When Adam, our ancestor, came into existence, he was given a spiritual knowledge about God that Adam had not had to search long and hard to get. “Excuse me,” a man said from just a short distance away. “My name is Shing. I am an Oroqen born in the Chinese province of Inner Mongolia. I have a question for you,” Shing said. “Why is it that you say God gives light to everyone who comes into this world? Where I came from, the government leaders were sending soldiers into the homes of Christians to confiscate their belongings and to take any Bibles they had. They also stole our property, even though I am not a Christian. Suddenly, some loud cracking sounds broke the relative stillness of the night. The sound of branches being snapped came from the woods beyond the light of the fires. Everyone looked toward the forest for a few seconds of fearful silence before some men and women quickly doused their fire with dirt and ran for cover. Steve stood still and waited. Sarah, standing just a few feet from him, closed her eyes and prayed quietly. Out from the darkness of the woods came more snapping sounds, but these were less loud. Soon, twenty to thirty figures appeared, walking through the concealing forest shadows. 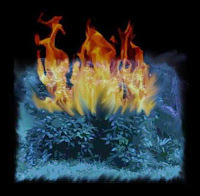 In moments, a few appeared in the light of the burning bush, which miraculously continued to burn. Now, Steve could see that these figures were soldiers carrying lowered machine guns. Sarah placed a hand over her mouth and swallowed hard, but Steve placed an arm around her back and drew her to his side. She trembled with fear as she watched the soldiers slowly stepping across the small opening in the forest, right past tents and backpacks. The soldiers were walking toward the burning bush, with curiosity and awe displayed on their faces, seeming to ignore the tents scattered here and there. They didn’t seem to notice the group of Asian Christians scattered nearby, huddled behind trees or boulders. Steve’s legs trembled, but he spoke to his Heavenly Father and gave the fear to Him. Then, a supernatural peace flooded into his soul, while he watched the soldiers. The terrified soldier ignored the order and continued running, glancing back now and again. He tripped on a log and fell, and cursed the forest before scrambling away. His commander ordered him to stop, but he continued running, melting into the woodland shadows. The soldiers obeyed and kept walking, but suddenly, a bright light appeared. They all dropped to the ground, releasing hold of their weapons, and several cried out in fear. An angelic warrior suddenly appeared, shining with pure, white light. He wore the type of armor and Corinthian-style helmet as the angels Steve had seen earlier. In his large right hand he held a large sword, and his left arm he carried a round shield that was shinier than polished chrome. The soldiers regained consciousness, and quickly scrambled to their feet, and ran for their lives into various directions. They had left their guns behind. As they ran, some threw their gear bags and helmets to the ground, to be less encumbered in their flight. In a few minutes, the crashing sounds of the terrified men faded from hearing. The angel stood at least fourteen feet tall. Add another six feet to his height, and he would reach the top of a two story building. His large, white wings were stretched out from his back, protruding from openings in the back plate of his armor. They resembled white eagle wings, but were larger than fighter aircraft wings. He was larger than the angels Steve had last seen and was very impressive with shining, white hair poking out from under his helmet. The angel briefly surveyed the people below him before he vanished from sight. Once the angel had vanished, the Christians came out from behind boulders, bushes, and trees, and blinked several times. Some of them pinched themselves to see that they weren’t dreaming. A great sense of awe descended on them and no one said a word. Even the children, who had been crying softly, were calm. Peace had fallen upon all in the group. “Steve, My son,” God’s loving voice spoke to his spirit and soul. “Yes, Abba Father,” Steve said, listening to the still small voice that he had learned to trust after seeing that God was faithful to His Holy Bible, and did not contradict the Holy Scriptures. “God wants us to continue moving north. We will stay overnight here, but shortly after dawn, we will pack up and move out. The Chinese are aware that some Christians have been hiding out in these woods. Some of the people that visit these woods have caught sight of Christians here. So, we need to move on. The soldiers were searching for us and would have either killed or arrested us, had it not been for God supernaturally blinding them and causing them to see a warrior angel who is guarding us. Snow flurries swirled around the man as he trudged through the thick powder. He could barely see twenty yards in front of him. His breath came out in small clouds as he walked, one foot in front of the other. The temperature was dropping and the snow was getting deeper, centimeter by centimeter. In a short time, it would be several inches deeper than it was when he first started off on his trek. He needed to find a place to stay and to warm himself up at, but he seemed to be a long way from any village. His feet felt numb, which was a bad sign. Frostbite might set in if he didn’t get his feet warmed soon. The moon shone through the pine trees and provided some light to his path in the mostly dark woods. It felt like he had been walking through the forest for days, but it had really only been three hours since his car got stuck in the deep snow. His cell phone battery had died and he had no way to charge it. He knew that waiting in the car was not an option because his gas tank was very low on fuel. To make matters worse, a dead tree had fallen over the road, in front of the car, blocking his way. He had not come prepared for a snow storm. After a few more minutes of walking, the man suddenly plunged up to the waist in snow. He must have reached the ditch at the edge of the road. 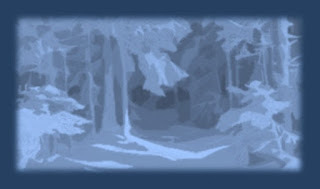 There was so much snow that he couldn’t tell where the road ended and the forest began. The man had just stepped into a deep patch of snow that had filled up a depression in the ground. He cursed himself for leaving his car and he cursed God, blaming Him for the snow storm. Now, he had to struggle just to pull himself out of the deep snow, but he was starting to feel exhausted from the long walk through deepening snow. Crawling and kicking, he finally pulled himself out of the hole, but found he was too exhausted to keep walking. Lying on the ground, he cursed his “misfortune” again and slowly breathed. If he stayed out too long in the cold, without moving, he knew he would freeze to death. But, tiredness was starting to overcome him. Suddenly, a loud, throaty buzzing sound came from the forest road. A light appeared in the distance, casting shadows through the trees dozens of yards away. Then, a green object appeared, racing across the snow. It was a snowmobile. The man picked himself up and, with every ounce of strength he could muster, he waved frantically and shouted. 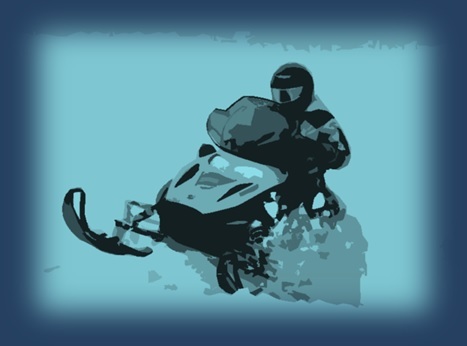 The snowmobile slowed to a stop and the engine idled, put-putting away. The driver got off and pulled a flashlight from a pocket. He shined it on the exhausted man, keeping the brightest part of the beam away from his face. Then, he reached out a hand. “Come with me,” the snowmobile driver said, extending his hand to pat the other man on the shoulder. “I certainly will,” Sergey said, lifting up his ski goggles. He walked to the back of the machine and opened a tool box. Drawing a folded coat from it, Sergey gave it to the other man, who gratefully took it and put it on over his own coat. Sergey handed him a thermos filled with warm water. After the man was somewhat refreshed, they both mounted the vehicle. Sergey grabbed the handlebar and sent the snowmobile roaring off down the road. The trees seemed to zip past like a rolling backdrop. Every so often, the snowmobile bumped over small snow drifts and the passenger gripped some handles tighter to keep from falling off. Ten miles later, the forest opened into a large clearing where the village of Medvedski rested. Smoke from hundreds of chimneys rose into the air like the breath of a dragon and blew away on the wind, while the blizzard piled the steep roofs with heaps of white powder. Soon, the snowmobile was buzzing down the snow-covered streets and approaching Sergey’s two-story izba cabin. Sergey pulled into an opened shed behind his house and parked beside a blue snowmobile. Then, he clicked his flashlight on in the dark shed. He helped the poor man up to the side entrance of his house. Once inside, Sergey filled a metal basin with very warm water and had the man take his shoes off. The wood stove door creaked open and Sergey plopped a couple more logs onto the fire. God had woken him from sleep to go on an errand in the midst of a snow storm. Sergey had been reluctant, but he knew God’s voice and wanted to obey his Heavenly Father. He had left the izba dwelling less than thirty minutes ago, while all his guests were in their upstairs rooms. Seeing the man in need, he was glad God had him do the errand. The man had looked like he was about to freeze to death. “Excuse me, sir,” the man said from the couch where he rested and warmed his cold feet. “I’m Sergey Ulanov,” Sergey said, extending a hand and Nikita shook it. “You said God told you to do that errand?” Nikita blinked several times, thinking about what his host had just said. After a few seconds passed, Nikita looked at Sergey as if he were looking at someone who had just told him the world was about to end. Sergey stood, concerned that his new guest might awake the others sleeping in the bedrooms upstairs. But, he felt God’s guidance to just let Nikita be. The ecstatic man was jumping up and down and singing bits of a hymn he had heard somewhere. Sergey waited to see if anyone would descend the stairs to see his new guest. Finally, Nikita calmed down and plopped down on Sergey’s only couch. A big grin crossed his face ― the look of a man who had just learned he was given a billion dollars. But, Nikita had gained something infinitely greater, and Sergey understood the joy he felt. While their backs were turned to the stairway, a man clutched the railing and watched the Christians below. Vasily Volvakov had heard the noise from his room because he was a light sleeper and had gone to investigate. While Sergey and Nikita talked, Vasily slowly ascended the steps to the second story and made a mental note of the events below. In the upstairs hallway, he pulled out his cell phone and began composing a text message. Vasily walked back to his room that he shared with another single man, who slept on the only bed in the small room. Vasily plopped down on a sleeping bag and pulled some blankets over himself. Some hours later, his cell phone vibrated in his pocket. Waking from sleep, he moaned and sat up. Wiping his eyelids, Vasily blinked a few times before checking his cell phone. He could see that there was a new text message. It read in part: “Sergey, a team will be assembled and … ” His eyes scanned over the message and a grin spread across his drawn face. A tangled web of bushes, boulders, and trees spread out in all directions, and the moonlit night sky hung above. The group of Asian Christians and four Caucasians found themselves surrounded by a dark and eerie woodland that presented all sorts of hiding places for enemy soldiers to watch and wait for their arrival. The group would be totally lost and easy prey for the roving eyes of Chinese soldiers had it not been for God’s presence and angels. And, the forest was so dark and dense that navigating it at nighttime would be impossible without a bright light, but no one in the group had a bright enough flashlight. Most of their batteries were running very low on charge. But, a miracle had happened shortly after Steve and the rest of the group awoke from sleep in the middle of the night. A rushing sound, like a light breeze, came from the forest near where the burning bush grew. The fire mysteriously had lifted off the bush, leaving it untouched, and had miraculously turned into a whirling shaft of flames, like a miniature tornado, before their eyes. It was about thirty feet tall and produced plenty of light for the group to see up to thirty or forty feet into the dark forest, depending on its density. God had spoken to Steve and to several of the Chinese men that they needed to follow the pillar of fire because that was God’s light source for them at nighttime. God had also instructed them to pack up their tents, but leave them behind because God had told the people that He would translate the tents and gear, so that they would not have to carry those cumbersome loads with them. Now, some miles had passed since they had left the encampment with most of their stuff behind. Steve was amazed to see the pillar of fire, or tornado of fire, not set any tree on fire, even though branches and twigs passed through its spiraling flames. Steve realized that God did not intend to burn the forest down. God was just providing light for the group, like the light source He had provided for ancient Israel when they traveled through the wilderness of Mount Sinai in north-western Arabia. “Yes, honey?” Steve said, looking at his wife, who walked beside him. The yellow light from the swirling flames cast a long shadow behind her, which leapt over boulders and logs. “Excuse me,” a lady’s voice said from behind them. The couple turned to see Mi-yeon, the Korean lady they had met earlier. Her husband was approaching from behind. “You did too?” Sarah said. Sung-woo, her husband, approached and greeted them with a brief ‘hello.’ Steve and Sarah echoed the greeting and returned their attention to his wife. “Mind if I join in?” Sung-woo asked his wife. “No. Go ahead,” Mi-yeon said. “You didn’t lie to them, did you?” Sarah asked. Steve and Sarah looked at each other, amazed. “I, I know you were telling the truth, but the soldiers just accepted your answers? They didn’t detain you?” Steve said, blinking several times. “That is amazing,” Sarah said, shaking her head in awe of God’s power and wisdom. “How did that work out? No money. Was that a high-speed train?” Steve asked. “They might have suspected we were not from that province of China, but I don’t think they knew we were foreigners,” the Korean man replied, grinning. “And, all the money had been spent well,” Sung-woo added. “That is an amazing story you experienced,” Sarah said. “Amen. We serve an awesome God,” Sung-woo said, turning his attention to the fiery pillar that slowly moved ahead of the group and lit up the forest around them with its supernatural flames. After four days had passed since the group of fifteen had arrived at his izba cabin, most of the guests had trusted in Jesus for salvation. Sergey was amazed at the results of his teaching and prayers. He thanked God every time he thought about the new believers. One night, after a group Bible study time, and after the families had retired for the night, a man came down the stairs and approached Sergey, who was sitting on the side of his bed. The man had short, dark hair and appeared to be in his thirties. “I want to talk to you about something,” Ivan said quietly. “What is it?” Sergey leaned forward, glancing at the stairway briefly. After they had talked a little longer, Ivan left and returned up the stairs. ‘Thanks, Lord Jesus. I will do that. It is only possible through you,’ Sergey said in his thoughts. “What did God show you?” Ivan asked. While the others were eating breakfast, Sergey climbed the stairs to the second floor, carrying a sandwich on a plate, an apple, and ten rubles, which had gained in value after U.S. had collapsed. Walking down the hallway, he fought with an inner fear that his gift would be rejected. ‘It will amount to nothing, Sergey,’ a nagging thought said. ‘You’re wasting your time.’ But, Sergey decided to give that fear to God and trust that God knows what He is doing. He knocked on the door to Vasily’s room. There was no response. He knocked again. Finally, the door opened and a sullen face stared at him. “What do you want, Sergey?” Vasily said coldly. “I want you to feel welcome in my home, Vasily. It is not often that I have guests. Will you accept this gift as a token of kindness.” Saying that, he extended the food and cash to Vasily. “What do you mean?” Sergey asked. Vasily was taken aback. He squinted at Sergey as if he has said that the world was going to blow up one minute from then. “How will your God deliver them?” Vasily asked. “So, if I became a Christian, and if I was put in a camp, God would deliver Me?” Vasily said. “Why can’t you?” Sergey asked. Vasily paused and lowered his eyes to the floor. “That is sad,” Sergey said, starting to feel compassion for his guest. Sergey paused to let the words sink in, but Vasily just grunted and folded his arms. “I don’t need to hear all this stuff. Just leave me alone,” Vasily said, reaching for the bedroom door. Sergey backed up into the hallway, and Vasily closed it slowly but firmly. Standing in the hallway still holding the food and money, Sergey felt downcast and discouraged. It seemed that his gift and conversation with Vasily had been to no purpose. “My son, Sergey,” Jesus said to his soul and spirit, “why are you downcast? You have done well. Vasily is thinking about what you told him. Don’t feel discouraged. Give these feelings to Me. I will take them. Rest, My son. You have caused him to think about Christianity and about Me. I will now tell you that very soon you will need to get the group together and tell them that they will need to prepare to leave the house because it will no longer be safe here. “Just leave those details to Me and I will bless you, My son,” Jesus said. Saying that, Sergey felt peace enter into his heart and the assurance that everything will work out. Bang! A loud thump came from the first floor, waking Vasily from his slumber. He groaned and stood to his feet, squinting. Bang! The thump was followed by a splintering crack. Vasily saw his cell phone lying on the bedroom floor. Picking it up, he read the time. It was 11:02 P.M. Bang. Crack. The sound of wood shattering came from below. Vasily winced and hurried to the staircase, wondering who it could be. He quickly descended the stairs to the first floor, but his jaw dropped when he saw the scene before him. The front door had been smashed open by way of a metal, hand-held battering ram, shaped like a cylinder with handles. A team of soldiers had broken through and were scanning the room with their machine guns. “Raise your hands!” a soldier ordered. Reluctantly, he raised his hands. Then, Vasily remembered the text message and earlier phone call he had made some time ago. The team sent to arrest the Christians had arrived sooner than Vasily thought possible. What Sergey had told Vasily about God did not leave his mind as he had settled into his sleeping bag two hours ago. Waking from sleep, being groggy and tired, Vasily had forgotten that a team of soldiers was on its way to arrest the Christians. He hadn’t thought that they would arrive this soon due to bad weather some days earlier. As he fell to the ground, a new thought struck Vasily. His roommate wasn’t in the bedroom on the single bed and Sergey was nowhere to be seen in the house. Surely, the people would have woken by now, having heard the loud thumping sounds and the splintering crack of the door breaking open. Sergey would probably be terrified to see the soldiers in his home and probably would try to hide in a bedroom since the house was likely surrounded by soldiers. But, the soldiers did not listen to him. One remained behind to guard him while several hurried carefully up the staircase and into the second story. Room by room, they cleared the building until they had reached all five bedroom, the closets, and one bathroom. After a short time, the soldiers descended the staircase and looked at Vasily coldly. He was still forced to lie on the ground, face down. “Stand up, Christian,” a soldier ordered gruffly. “I’m not a Christian!” Vasily said angrily as he stood to his feet. Pain shot up his cheek. “Sure you are. Stand against that wall,” a soldier ordered. Another shoved him up against the wall while a different soldier snapped handcuffs around his wrists. “You don’t believe me? I am friends with Alexander Lukov!” Vasily screamed. “Come with us,” a soldier said, shoving him forward. Vasily, protesting and screaming, was shoved out into the snow. He fell face first into a pile of white powder. Coughing and spitting snow from his mouth, he cursed the soldiers and cursed God. A soldier slapped him in the face and ordered him to be silent. But, he wouldn’t stop cussing at them. Then, a soldier drew out a truncheon and clubbed him over the back of the head. Vasily fell to the ground unconscious. 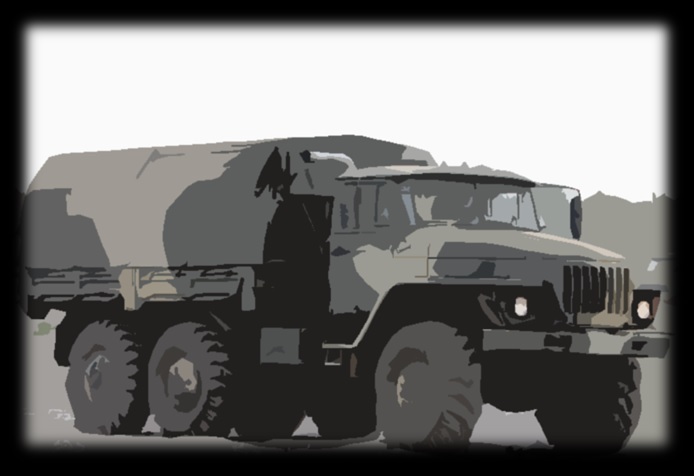 The soldiers dragged him up to a six-wheeled military truck with a canvas top, and hauled him into the truck bed. Others loaded into two other six-wheeled trucks. With a guttural roar, the diesel engines revved up and the trucks roared off through the recently plowed streets. The few cars and trucks on the streets pulled over to let the small convoy pass through. A few hours later, they arrived at a small military base in a pine forest and quickly passed through the guarded entrance. Vasily, who had come to during the drive to the base, was ushered into a small jail on the base designed for misbehaving soldiers. Sitting in the cinderblock cell on a hard, metal seat, he screamed at and cursed the men who brought him there and at God for allowing it to happen. But, they had already left the prison and were handling the paperwork to admit a civilian into a military prison. This would be a temporary holding place. Breathing hard and sputtering with saliva dripping from his lips, Vasily calmed himself down, and wiped his lips with the back of his hand. He did not understand how the people had left the building while he was still asleep. Surely, he should have heard people talking. He should have heard doors shutting. ‘How did Sergey know that I had reported his evangelism?’ Vasily thought. Time passed. Vasily paced his cell, thinking about what Sergey had told him. God would deliver him from trials, according to Sergey, but only if he became a follower of Christ. ‘But, why would the soldiers arrest me and blame me for the Christians’ escape?’ he thought, feeling confused and troubled. “Surely, you remember who I am?” Vasily said, coyly. “That’s what our information says,” Alexander said coldly. “It is now believed that you assist Christians in escaping capture by sending our soldiers on wasteful missions while the Christians escape. Last year, you told me that you knew of non-conformist Christians meeting in a basement every Sunday. “When we sent a team to apprehend them, no one was to be found. The person who owned the building had no knowledge that the basement was being rented out by non-conformist Christians. While our teams were busy with that diversion, we learned that a sizeable group of Christians had been seen driving in some vans toward the wilderness up north. They were known to be Christians because they stopped at a gas station and some of them were seen carrying King James Bibles. “What? This is outrageous,” Vasily sputtered, trying to grasp what he was being charged with. “Tomorrow, you will be shipped to an internment camp to reeducate you,” Alexander said before ending the call abruptly.